Department, and the Hungarian Ministry of Environment. to Hungary for a visit last year and enjoyed vistiing all my friends there. Serving in the Peace Corps was a very rewarding experience. came back in June of 2001. Kosovo with my husband Lyndle. Niger/1989 left after 13 weeks due to allergy to malaria med. Charlie passed away in 1996. Paradigm for the New Millenium," travel a lot for public speaking. wouldn't trade those years for 100 more in solitude anywhere! incredible, but get ready to be anonymous when you walk into a store. A brief synopsis of my PC service and beyond: I served in Hungary from 1991-94, continued to live there till 1997, then came back to the US for two (uneventful) years. 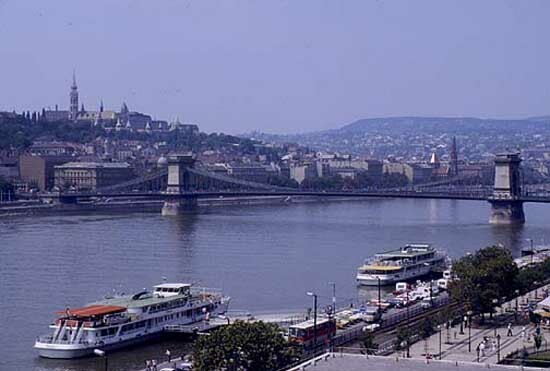 In 1999 I moved back to Hungary and lived and worked there as an ESL teacher for three eventful years. Since July 2002 I'm back in here in the USA - it was carefully planned, and it feels great! Any future reunions planned for Hungary? This is the most recent info for us (Chris & Annamari Winters). We left Hungary in 1999, moved to Seattle where we still live. Chris works as a reporter for the King County Journal newspaper in Bellevue, Annamari finished an M.Ed. in TESOL and now teaches English to more freshly-arrived immigrants at Shoreline Community College. Contact us at winterscsa at earthlink dot net. A H8 reunion is planned for 2005. More details later. If you know anything about Donald Holub, please drop a mail at zbalai@yahoo.com. Thanks! MA in Sustainable International Development.Married Dragan Blanusa in 1998, we celebrated our marriage with family and friends on September 4, 1999. Our son Aleksandar Gallagher Blanusa was born September 4, 2003. Currently living in NJ and working in NYC at the National Council on Economic Education. Stay at home Mom of two daughters. Graduate degree in atmospheric science inspired by living in Kazincbarcika. I look forward to finding a job as rewarding as teaching secondary school in Hungary. Latvia (Language Coordinator), Summer 1992. PC Africa Region (Country Desk Officer-Ghana, Benin, Togo, Burkina Faso), 1993-1997. Now work as a local history museum curator. I was in Hunagry III. the first group of environmental volunteers. I served from '92 - 94, in Miskolc, and then in Pecs. I stayed in Hungary until January of 2000, and got married over there. First working for the Hungarian Academy of Sciences and then starting a development consulting firm INDEV BT. I ran an environmental technology incubator in California up until the dot.com crash sunk the Bay Area economy. Now I am based out of NY and consulting again. Living in New Jersey with the Hungarian wife, Agi (go figure) and our two kids. I'm trying to track down Nancy Picard. '90-'92. Any e-mail leads would be appreciated. Gosh, I can't believe I found this site! My name is Agnes Farkas-Roszell, formerly known as Farkas Agi and used to work as Program Assistant in Education for Kathy Rulon. I recognize a lot of your names. I can't believe so much time has gone by. I live in Colorado. I am in touch with Sharon Fuller and would love to hear from any one of you!!! This is Dave Johnson - aka Szuper-Dave. I am glad to hear from any PCV anytime, especially if they are Hungary 8, especially if they are Sarah Pearson.